2017 - 18 విద్యాసంవత్సరానికి సంబంధించి డీఈడీ పరీక్షలు వచ్చే ఏప్రిల్‌ నెలలో జరుగును. ఎలాంటి అపరాధ రుసుము లేకుండా January 24వ తేదీ వరకు పరీక్ష ఫీజు చెల్లించాలి. రూ.50ల అపరాధ రుసుముతో January 28 వరకు చెల్లించే అవకాశం ఉంది. రెగ్యులర్‌ విద్యార్థులకు పరీక్ష రుసుము రూ.250లు. ఒక్క సబ్జెక్టుకు రూ.125ల చొప్పున రుసుము చెల్లించాలి. Office of the Director of Government Examinations, Telangana has released the fee remittance schedule for Diploma in Elementary Education (D.El.Ed) 2nd year examinations of the 2017-2019 batch. The D.El.Ed 2nd year examinations for the 2017-2019 batch will be conducted in April 2019. The failed candidates in earlier batches (from 2015-2017 only) who have studied revised syllabus are also eligible to appear in this examination as once failed candidates. The principals of the institute must submit the examination fee in the Government treasury by December 18, 2018 and for candidates who submit examination fee late by December 27, 2018. The web link to upload application will be made available on the official website from December 10, 2018. 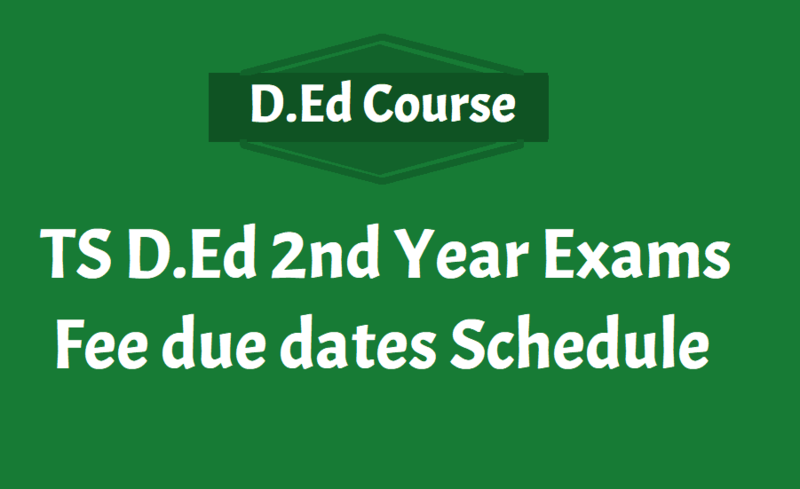 The examination program for D.El.Ed 2nd year examination for 2017-2019 batch will be released in due course of time on the official website of BSE, Telangana. d) approved lists of Convener and Management quotas in the office of the Director of Government Examinations, Telangana, Hyderabad. Treasury to the following Head of Account. All the principals are requested to furnish information relating to the candidates and other than 2017-2019 batches online duly furnishing the MNR (Manuscript Nominal Roll) along with fee challan.